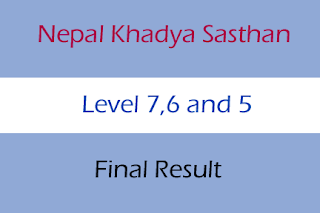 Nepal Khadya Sasthan (Nepal Food Corporation) published final result of Senior Officer level 7, Officer level 6 and senior assistant level 5 on date 2075/05/09 . Here is highlight on Senior Officer and Other Post Final Result 2075 Nepal Khadya Sasthan. Interview for these post were held on 2075/05/08 and 09. Advertise Number for these post are 19/073-074, 23/073-074, 24/073-074, 25/073-074, 26/073-074, and 27/073-074 according to Nepal Khadya Sasthan. Check complete result below.